Product #562 | SKU DELUXE FLY | 0.0 (no ratings yet) Thanks for your rating! ikan introduces its Elements line of video support equipment with the Deluxe Fly Kit, a lightweight, modular support rig designed to work with any DSLR or other small camera. Made of anodized aluminum and comprised of 8 basic parts, the Deluxe Fly adds comfort and image stability to the often awkward process of shooting video with a digital still camera. Not as heavy or cumbersome as a full rod system, the Deluxe Fly uses the same foundation as the Basic kit--two foam-grip handles, two attaching, movable arms, and base plate--and adds a rod mount to accommodate the two included 15mm rods. 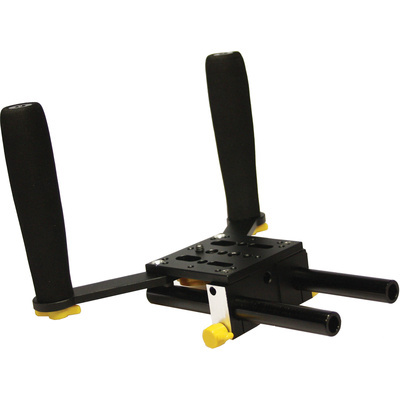 These provide added flexibility to the rig, affording greater control over camera balance and placement while allowing the use of additional accessories. Completely configurable for cameras past, present and future, the Fly is an affordable, future-proof investment in support gear that will evolve and grow from one production to the next, for years to come.